Discussions are underway over plans for a place of worship and conference facility, with enough space for a congregation of 1,400, as part of the new community being created at Waverley in Rotherham. Approved in 2010, the largest, most complex, planning application ever considered by Rotherham Council gave outline approval for South Yorkshire's largest ever brownfield development, with a new 3,890 home community across 741 acres of the former Orgreave coking works site. Brought forward by landowner and developer, Harworth Group plc, it also includes the world-renowned Advanced Manufacturing Park (AMP). Now, a pre-application enquiry has been submitted on behalf of Hope City Church which will see planners at Rotherham Council discuss the new scheme with planning consultants and architects. 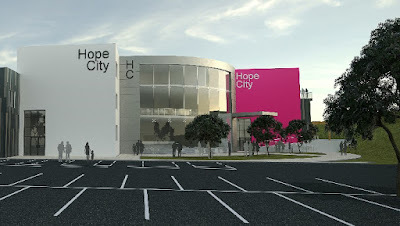 Plans show that the primary use of the "Hope City Enterprise Centre" will be as a church and the proposal will enable the relocation of the church's operational activities from its current site at the Megacentre in Sheffield. Located to the North of the AMRC Training Centre, the 66,000 sq ft centre is designed so that conferences and exhibitions for up to 1,400 delegates can be held within the main auditorium and break-out areas. Plans also include a café, offices, 5,000 sq ft nursery, training rooms and a youth hall. The current proposals are for two separate parking areas of 100 and 360 spaces each. There is the potential for the car parks to be used, by arrangement, by the training centre and AMP. Hope City is a contemporary multi-locational church and part of the global family of c3 church and a not-for-profit company limited by guarantee. C3 Church Global was started by Phil and Chris Pringle in Australia. In the UK, Hope City was launched in Sheffield in 1991 by Dave and Jenny Gilpin on their return from Australia. The church bought an old tool factory next to the Sheffield Parkway in 1998 and has expanded into a number of other cities. Fundraising began in 2015 for the Waverley site, with at least £1m needed for the new centre. The masterplan has been updated a number of times and plans have been developed for the land between the AMP and the new houses, previously known as Highfield Commercial, which had outline planning approval for a 645,000 sq ft government office campus and hotel. When the plans were withdrawn following the economic recession, the £20m AMRC Training Centre and the Marston's pub were built instead. At the centre of the site, plans have been approved for a £50m retail, office and leisure scheme. Earlier this year, plans for the remaining land at Highfield Commercial showed that there was the potential for a 27,000 sq ft hotel (up to five storeys) and a 35,000 sq ft conference centre, plus a large car park.